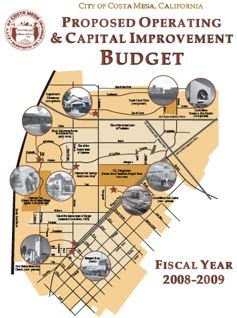 Just about a year ago I wrote a little entry talking about the 2007-2008 Costa Mesa budget. At the time it seemed as though no one in our city cared a whit about how much money was going to be spent on their behalf. Nor, it appeared, did they care about the way it was spent. Very few people showed up at the community budget workshop. "Very few" means 3 people! Well, here we are, another year, another budget workshop and (yawn) no one cares! Thursday, June 12th, I attended the most recent iteration of the budget workshop conducted by City Manager Allan Roeder, Finance Director Marc Puckett and his strong right arm, Bobby Young. As in years past, it was sparsely attended. Because of a strong marketing effort on my part (he says, tongue firmly implanted in his cheek) there were twice as many residents in attendance this year. Your friendly correspondent and long time resident and council-watcher Beth Refakes were there for the duration. Park and Recreation Commissioner and former council candidate Terry Shaw, busy guy that he is, arrived a little late and left a little early. Eastside residents Jeff Harlen and Jim Fitzpatrick, both of whom are recently-energized activists, attended, but had family commitments that forced them to depart early. That was it! In a city of over 110,000 souls, five of us cared enough about how our tax dollars are being spent to attend all or part of this excellent workshop. To be entirely fair, a couple dozen residents attended the City Council Study Session on the 10th, during which the presentation was made to the council. Some asked questions and made suggestions. So, in actuality, fewer than 30 people cared enough about the budget to attend either meeting. What does that tell us? Well, I think it tells us that most of the populace feel they are in good hands when it comes to money management in our city. Others might say that most people just don't give a rat's patoot... I prefer the former. Having watched Roeder and Puckett in action for several years, I have a great deal of confidence in their ability to analyze the needs of the city and create solid financial plans to accomplish them. This year's budget is no exception. Here are a few numbers for your consideration: This year the city plans to spent almost $145,000.000 on your behalf, up from around $131,000,000 the previous year - an increase of 10.57%. 80% of our revenue is derived from Sales and Property taxes - Sales Tax=43.67% and Property Tax=27.61%. The remainder comes from a variety of much smaller sources, the largest of which is the Transient Occupancy (Bed) Tax, at 5.34%. 48.27% of the Operating Budget will be spent on Salaries, 13.31% on Retirement benefits and 5.20% on Debt Service. According to a dandy little chart in the Budget at a Glance booklet available to all residents, for the fiscal year 08-09 the Median Residential Property Value in Costa Mesa is $600,000. Property Tax paid on that amount is $6000. Of that amount, $900 is distributed to the city. Of that $900, $504 (56%) goes to Police and Fire services. The largest hunk of money typically spent in our municipal budget goes for the people employed by the city in terms of salaries and benefits. During the presentation City Manager Allan Roeder stated emphatically that he advised his management team that no additional staff will be authorized during the new fiscal year. On the subject of Police and Fire services, most of us know that the City of Vallejo in the Bay Area recently filed for bankruptcy, in great part because they were spending more than 80% of their total budget for Police and Fire salaries and benefits. Costa Mesa's budget shows slightly over 50% for the same line items. Expenditures for the Capital Budget is up 41.35% this year. The city plans to spend more than $10,000,000 on road and infrastructure improvements during this budget year. That's a lot of pot hole repairs, street re-paving, bike paths and turn lanes to be installed. SPENDING MORE THAN WE TAKE IN! This year the city plans to spend slightly more than $10,000,000 more than they will take in from all revenue sources. "What?! ", you say. "How can they spend more than they will take in? What kind of fiscal management is that?" Glad you asked. The short answer is that it's outstanding fiscal management. The even shorter answer is two words - Fund Balance. Remember that $131,000,000 they budgeted last year? Well, they don't just prepare a budget, then start writing checks until the money runs out. The city staff keeps their finger on the financial pulse of our city throughout the year. They spend the money when it's needed and don't when it's not. Fund Balance is what's left over from the budgeted number that has not been spent. This money has been taken out of the 07-08 pocket and placed in the 08-09 pocket to balance this year's budget. Slick, huh? Oh, yes. In case you're wondering, the Emergency Reserve is around $14,125,000, just about the same as last year. "OK, Pot Stirrer, you've got my attention", you say. "How can I find out more?" Glad you asked - again. The city has prepared budget documents for every level of interest, beginning with the aforementioned Budget at a Glance pamphlet. Between that and the full-blown budget document there are two others - the Budget Study Session workbook and the Proposed Operating and Capital Improvement Budget Summaries - which will provide more information than most of us will ever need. Copies can be obtained from the Finance Department. Additionally, the budget is available online for download - don't try it without a high speed internet connection - it's a couple hundred pages of pdf file! If you want to see some of the Powerpoint and Video segments you can go to the city website - there's a link on the right of this page - and follow the links to Costa Mesa TV, then to the Archived Videos. There, via streaming video - also requiring high speed internet - you can view the June 10th Study Session, which includes the entire dog and pony show presented to the City Council. Tuesday, June 17th, the City Council will consider and adopt the final 2008-2009 budget. That session starts at 6:00 p.m. in the City Council Chambers. You can view the proceedings live on CMTV, Channel 24 and also on live steaming video on your computer. The meeting will be replayed during the week at various times. So, neighbors, once again the city staff, led by Allan Roeder, has managed to keep us out of financial quicksand through diligent attention to the management of this city and the preparation of a sound budget. There is a display case in the Finance Department lobby full of awards bestowed on The City for the preparation of budgets in previous years. Thanks to all of them for continuing excellence in the performance of their duties for our city. Here's one of the dilemma's we face. I've stated many, many times that I will not permit posts by "Anonymous" on this blog. I've tried to navigate and make sense of other blog comment threads where there is no restriction and multiple posters use "Anonymous" as their handle. It's impossible to follow the thought process in those cases - hence, my restriction. Then comes along a new person with an excellent question that really should be answered, but he's used "Anonymous". Drat! So, being the sole arbiter of what is fair here, I've decided to provide you with the question - and the answer. Has the city budgeted for decreasing property taxes due to the re-assessments resulting from the downturn in the RE market? I do appreciate the question. The problem, of course, is that I can't add! :-) 70%, not 80%, is the portion of General Fund Revenue contributed by Sales and Property Taxes. Not only that, but I eye-balled it three times before I wrote the entry above - but didn't use my calculator. Sorry about that. The remainder of the dollars contributed to the General Fund Revenue were in small segments. The charts available in the budget online at the city web site will reflect the distribution. be both realistic and responsive." Great care is taken each year by all the members of the city staff, and the Finance Department staff in particular, as they juggle priorities and income to achieve the goals laid out by the residents through their elected representatives. If this Anonymous person has other questions I encourage him or her to pick a pen name and drop me a note, either here or at the email addressed on my Profile page. Regardless, thanks for the good questions and for pointing out my "digital deficiency". Sorry, I read your objection to anonymous posters ages ago, but forgot about it yesterday when I was inspired to ask you a question. Roeder, during the Community Budget Workshop last Thursday, was very, very specific and emphatic. The staff has been instructed that there will be NO staff increases approved during this next fiscal year! It's really helpful to read his entire comment, lengthy though it might be, in order to get the real feel for his attitude. Tonight's meeting may have some curves thrown at the staff since both Bever and Leece were absent from the Study Session. We'll see.